Can Am Crown 250 winner Rene Marchildon struggles with his team as they head into the finish line at Fort Kent late in the day Monday after breaking through more than a foot and a half of new snow the last 40 miles of the race. Despite mushing through what was arguably the toughest Can Am Crown 250 race in the event's 19-year history, 62-year-old Jamie Nelson is all smiles as she guides her team to a third-place finish - just over a minute out of first place Monday afternoon. Jason Barron of Lincoln, Mont. 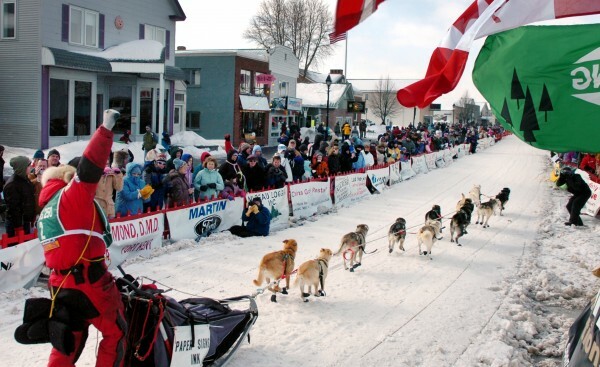 encourages the crowds lining both sides of Main Street in Fort Kent at the start of the Can-Am Crown International Sled Dog Race in 2009. 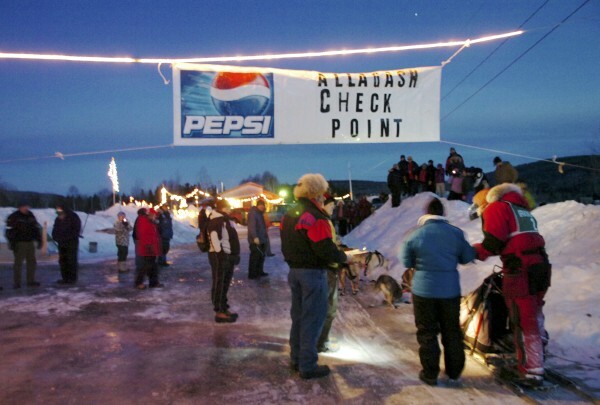 Timers and checkpoint coordinators check in musher Jason Barron of Lincoln, Mont. to the fourth and final checkpoint at Two Rivers Lunch restaurant in Allagash in 2009. FORT KENT, Maine – They called it “camping on the trail,” but what four Canadian mushers and their dogs experienced outside of Fort Kent was a far cry from a typical winter outing as the 2011 Irving Woodlands Can Am Crown 250 ended under some of the worst conditions in the race’s 19-year history. 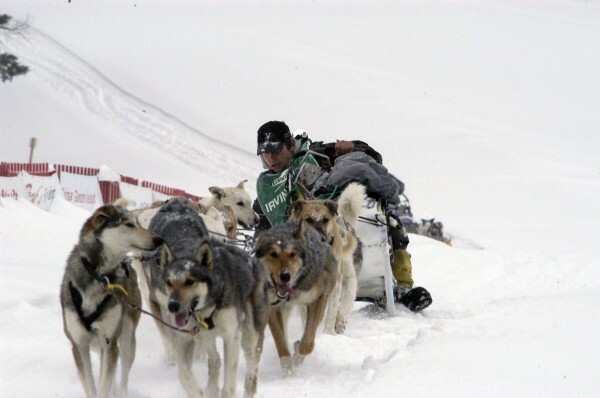 Over about a 15-minute span just after 3:30 a.m. Monday, Rene Marchildon of Ontario and Andre Longchamps, Martin Massicotte and Denis Trembley, all of Quebec, hitched up their dogs and pointed the teams down the trail for the final leg of the race. In a typical year the top teams cover that stage in five to six hours, but this was anything but a typical year. Two days earlier the men were among 23 mushers who had left Fort Kent at the start of the annual 250-mile race through the Maine wilderness. The snow showers of that morning turned to rain before the teams arrived at the first checkpoint in Portage, 64 miles down the trail, and by the time the mushers began pulling into checkpoint two at Rocky Brook 48 miles later, they had been running through a downpour for close to 15 hours. One by one, teams began dropping out as punchy trails, sodden gear, dispirited dogs, personal injuries and illness began taking their tolls. Four mushers scratched from the race at Rocky Brook, another seven at or on the trail out of checkpoint three at Maibec and one more at the final checkpoint in Allagash. By day three, 11 teams were left to navigate the trail back to the finish line in Fort Kent. They were just in time to face the heaviest snows of the season. The four Canadians left Allagash first, followed about two hours later by Jamie Nelson, the 62-year-old four-time Iditarod finisher who has successfully run 16 Beargrease Marathons and finished the Yukon Quest. Five other mushers pushed out into the storm later that morning and by 4 p.m. all had either returned to Allagash to drop out or scratched on the trail — some only 17 miles from the finish line. Only Can Am rookie Krister Raasoch waited out the storm and left Allagash late Monday night to cross the finish line almost 10 hours later, one of only six to complete the course this year. He might have been the smartest of the bunch. When Marchildon left Allagash he had close to a two-hour race run-time lead on Longchamps, but that advantage eroded under a snail’s pace of breaking trail through close to a foot and a half of new snow for 40 miles. Marchildon remembered being angry seeing Longchamps and knowing he was in danger of losing his hard-fought lead in the race. And then Longchamps did something that Marchildon may never forget. “He looked at me, held up one finger, and said, ‘You are still number one,’” Marchildon said. Moments later Trembley and Massicotte showed up. Massicotte said and Tuesday he knew right away the two mushers ahead of them were in trouble. Trembley, an experienced woodsman, knew all four would be in a bad way if they did not at least try to get warm and dry, so he set them to digging a fire pit, gathering wood and establishing a makeshift shelter out of branches, tarps and bungee cords. Soon after a race volunteer who had been dispatched by Can Am officials to look for mushers on the trail arrived on a snowmobile. But the four men had not counted on Nelson, who had remained on the move from Allagash and who overtook them as they rested next to their fire. They got going, but true to their trail-side pact, the four men left in order — Marchildon, Longchamps, Massicotte and Trembley — and despite the fact there were times in those remaining few miles either four-time CAC 250 winner Massicotte or Trembley could have passed Longchamps or Marchildon for the win, they deferred. Even when Marchildon had to come to a complete stop to take one of his dogs off the line and place it in his sled bag, thus opening the door for Longchamps to take the lead, the Quebec musher stood on his brake and held back his own team until Marchildon got going again. The thought of that and what the mushers and dogs experienced brought Marchildon near tears Tuesday night. When the idea was broached to allow Marchildon to proceed first to the finish, the Ontario musher said he was moved beyond words. “It just blows me away to be at this level of competition and to come to an agreement like that,” he said. Meanwhile, up the trail Nelson was edging closer and closer. 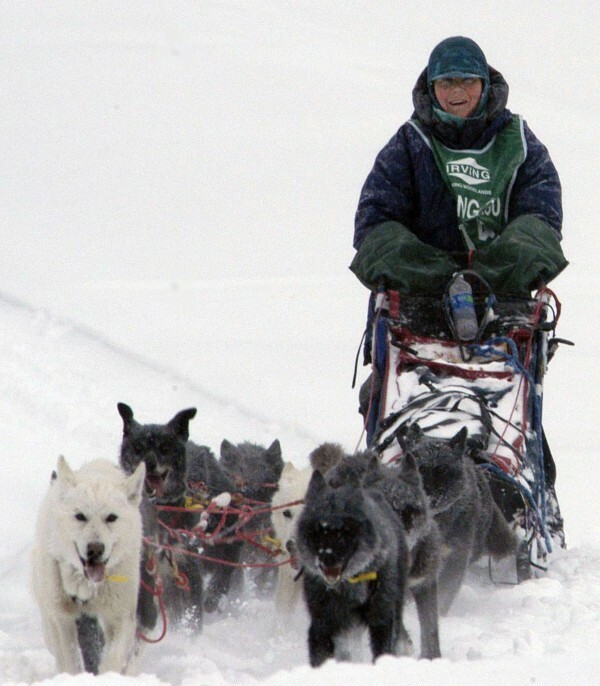 Her team of dogs had already passed numerous other mushers — many less than half her age — over the previous 200 miles and she was not about to let something like a northern Maine blizzard stand in her way to the finish line. For Nelson, quitting on the trail was simply not an option. To run a race like the CAC 250, Nelson, who with fellow musher Ann Stead runs a successful Mushing Boot Camp, said a musher has to be tough — mentally and physically — and at all times remember they are the linchpin holding the team together. “As the musher you are the coach and the dogs are the team and as the coach you have to stay on top of things,” she said. Nelson said her steady progress to the finish was delayed only by the presence of the four Canadian mushers camped on the trail. “I had to wait for them to move on,” she said, adding she had come to finish the race and declined the invitation to join in the agreement to finish in their current running order. With that commitment to race down to the end firmly in hand, Nelson went on to pass both Trembley and Massicotte, ultimately finishing in third place just seconds behind Longchamps. While that decision may have created some hard feelings among those involved, at the awards banquet Tuesday night Nelson made it a point to talk with Marchildon, afterwards saying she had “said my piece” to him. As for Marchildon, he had nothing but praise for his four-legged teammates and for all the mushers on the 2011 CAC trail. “I can’t get over what those little animals do for me mile after mile,” he said of his dogs. And of Longchamps, Massicotte and Trembley?